A short blog post to introduce you to my video below. Basically, the premise is that you are going to get a C+ in life unless you start learning to have more fun and take yourself less seriously. 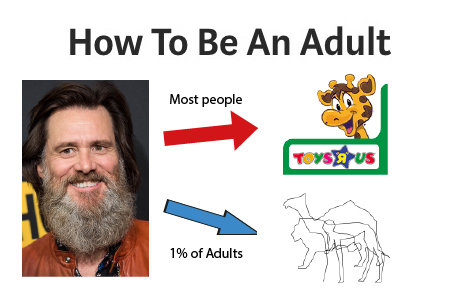 Take it from Jim Carrey, who had much more fun and much more fame and fortune than you or I will ever enjoy…it is never too late to become the adult (and child) that you deserve to be. Why bother? Well, discovering how to accomplish those tasks may lead to a longer and happier life! What is the common denominator in all you tragedy, suffering, and desperation? It’s the fake identity, ego, and demons that you are nurturing.